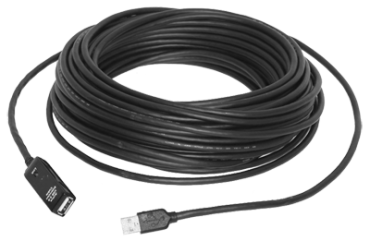 This 65.6 ft. (20m) shielded active cable supports the full bandwidth of USB 2.0 and can be used to extend all USB 2.0 products. The cable's female end connects to your USB device and the male end connects to your computer, extending USB audio, video, and control with one repeater hub in situations where the USB device and comptuer cannot be located near each other. When extending Vaddio devices the cable is conveniently port-powered - an optional 5V power supply for the female end is also included for extension of non-Vaddio devices.